March 6th to 8th was a long weekend in South Australia. The state has created a public holiday so that its residents can celebrate and watch the Adelaide Cup, which is a horse race. The race which began in 1864, is very much a part of South Australia’s heart and soul of sporting and social events in the state. Taking advantage of this long weekend opportunity, we were fortunate enough to participate in a three day tour of Kangaroo Island. The tour was arranged by the South Australia Teacher’s Exchange League (SATEL). In summary, the trip was fabulous! 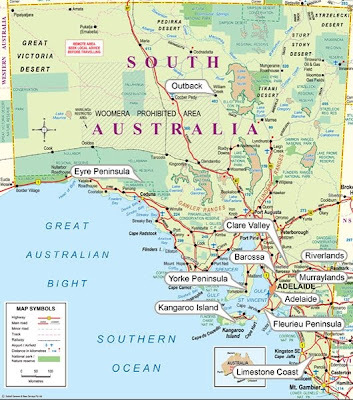 Kangaroo Island, known locally as KI, is located due south of Kadina and the Yorke Peninsula. KI is Australia’s third largest island being approximately 155 km long and 55 km wide. It is estimated that one half of Kangaroo Island’s land base is either bush land or National Park. Based on some of the travel journals, KI is considered the best place in Australia to see marsupials in the wild. This may be due to the fact that the island is free of introduced foxes and rabbits. Foxes are predators of some of the marsupials while rabbits forage and destroy native habitat of others. Given the abundance of native wildlife and the many beautiful coastal vistas, Kangaroo Island was ranked, by the National Geographic Traveler Magazine in 2007, as being the Best Island for tourists to visit in the Asia Pacific region. Remarkable Rocks are a large cluster of naturally sculpted granite rocks that appear to be sitting precariously on a dome that juts out from the ocean. These rocks have been eroded by wind, rain and sea spray over a period of 500 million years. They were not only remarkable; they were incredible, fantastic, awesome, amazing and humbling. To see such large rocks with their scouring tell-tale signs of erosion only reinforces the power of nature. One can only imagine the erosive energy that is needed to crave the rocks into such a picture of beauty. At Remarkable Rocks, you know that time is not told in seconds and hours. Instead time is told in eons. Originally formed as a single granite monolith, these seaside rocks were shaped using the same rock building process as that used to form Uluru (Ayers Rock); with the difference being that they have been subject to constant erosion. Rick and Greig inside the Remarkable Rocks’ Hatchery! Gail on the Bench. Note the orange algae. Admiral’s Arch is another spectacular rock formation. Sculpted from thousands of years of erosive weathering, a natural arch has been created. Added to this nature beauty is a colony of New Zealand fur seals that feed, laze and cavort in and along the shoreline adjacent to Admiral’s Arch. While visiting the arch we had a “special moment”. To see the seals from the first view point was something in itself. Then to continually wind your way down to the arch with each viewpoint being more spectacular than the previous was unbelievable. And then to arrive at the arch, take in the scenery, listen to the surf crashing against the rocks and watch the seals frolic in the water was a “special moment”. We knew that we were witnessing and feeling something that cannot be properly described. You had to be there to take it in. The Poser was ready and waiting for us! Hike from Hanson Bay to Kelly Hill Caves: We know very little about Australia’s vegetation or wildlife. Eighty percent of the native vegetation in Australia appears no where else in the world. What we know is from what we have seen on television or read in books. We went on a two and a half hour walk that brought all of this to life. To walk from the coastal sand dunes, into a dense shrub environment and then into a eucalyptus forest was a perfect illustration of the transition of plant communities living in harmony with their conditions. To see kangaroos and then an echidna just as we were finishing our walk was icing on the cake. We think that maybe one of the SAETL people rushed ahead to put one there for our viewing and photographic pleasure. Echidna – a spiny anteater! Koala. Yes, we know. It looks like a toy stuffed into a tree, but no – it’s the real thing! Kelly Hill Caves is a huge labyrinth within the limestone formation lying beneath the surface near the area encompassing our hike. Inside the caves are impressive displays of stalagmites and stalactites. Into the Jaws of ??? Our Kangaroo Island trip was truly a memorable experience. We are most thankful to the SATEL volunteers who planned and organized this tour. Many of the Canadian Exchange Teachers living in South Australia this year were with us on this tour and we know they too share our appreciation towards SATEL. Beautiful photos. I'm glad you could enjoy some of South Australia's natural beauty. What a phenomenal experience. PHENOMENAL!